Justin Jackson carries the ball. The senior running back ran for 144 yards in the final Big Ten game of his career. CHAMPAIGN — File this as a no-drama November for Northwestern. The No. 22 Wildcats (9-3, 7-2 Big Ten) plowed past Illinois (2-10, 0-9) 42-7 on Saturday, easing through the regular-season finish line with their seventh straight victory. After three consecutive overtime wins culminating in a Nov. 4 thriller against Nebraska, NU has found gentler waters lately, winning its past three games comfortably as it closes out a banner season. The Cats came out of the gate slowly this week, allowing the Fighting Illini to draw first blood with a 69-yard first-quarter touchdown march and squandering a drive inside Illinois’ 5-yard line when junior quarterback Clayton Thorson tossed an interception. But against a flailing Illinois team that entered the day winless in Big Ten play, the lethargic first quarter didn’t matter. NU bounced back with a 14-point second quarter and settled into the driver’s seat with a defensive score early in the third. Freshman defensive end Sam Miller dove into the end zone following a strip from sophomore end Joe Gaziano to give the Cats a 21-7 lead. NU coasted from there. The Cats have toppled Illinois in each of their last three meetings. Now on the doorstep of their second 10-win season in three years, they will await their bowl fate. This year’s bowl games will be announced Dec. 3. 1. The Cats own the second quarter. NU scored a pair of touchdowns to turn a 7-point deficit into a 14-7 lead in the second frame against the Fighting Illini. 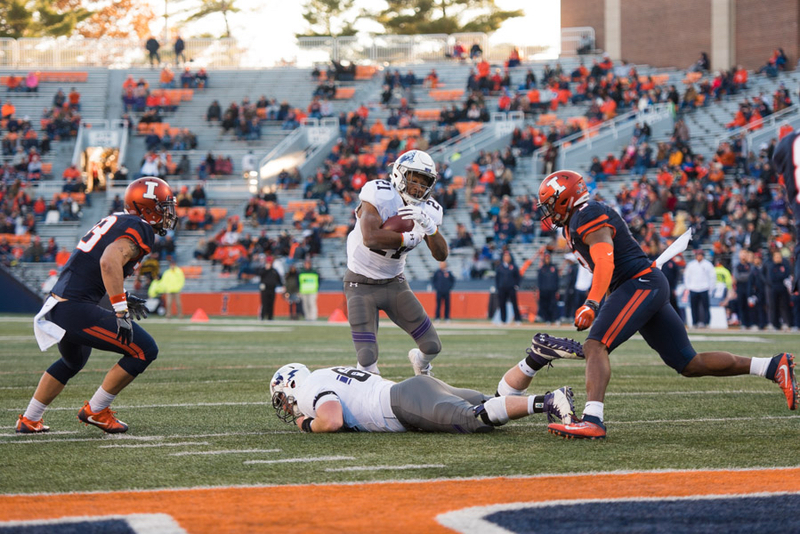 The Cats also clamped down defensively, holding Illinois to just one first down in the quarter as they took a one-touchdown advantage into halftime. The success continued a recent trend for NU, which outscored Purdue 14-0 in the second period two weeks ago and put up 25 second-quarter points in its 39-0 rout of Minnesota last week. 2. Illinois still has no answer for Justin Jackson. The senior running back racked up 130 yards against the Fighting Illini in 2014, upped the ante to 172 at Soldier Field in 2015 and topped that total with 173 in the season finale last fall. Jackson kept it going here Saturday, blazing his way to 144 yards on 18 carries as he once again left the Illinois defense in the dust. The senior raced 79 yards down the sideline in the third quarter, the longest rush of his career, and punched in a one-yard touchdown on the following play. For his career, Jackson ran for 619 yards against the Cats’ in-state rival. 3. NU’s defense flexed its muscle once again. Illinois’ offense is far from great. But the Fighting Illini had managed the modest accomplishment of scoring double-digit points in their previous seven games going into Saturday. The Cats dismissed that streak, holding the Fighting Illini to under four yards per play and turning them over three times. -Clayton Thorson: 13-for-21, 140 yards. -NU: first defensive touchdown since Oct. 24, 2015.